The honest Eighth Grade movie that has critics buzzing. The painfully honest film about a 13-year-old girl that critics can't stop talking about. If you’ve ever been a teenage girl, it’s not difficult to sympathise with the pain portrayed in the new film Eighth Grade. With the exception of Angus, Thongs and Perfect Snogging, most teenage movies showcase a rebellious side of teenage years that few ever actually experience. 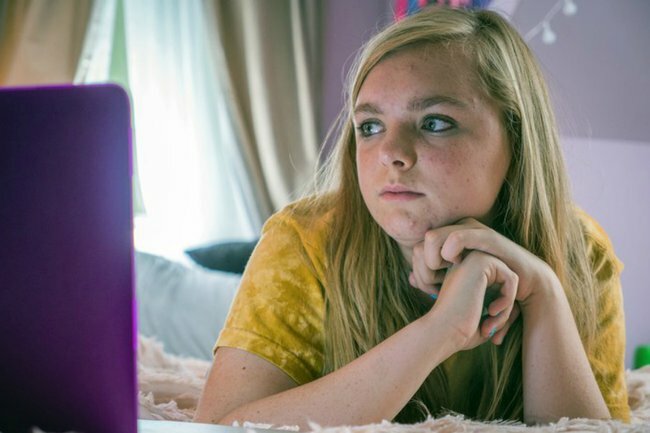 For many, teenage years are riddled with anxiety, and weeks after its release, critics are praising Eighth Grade, directed by 28-year-old Bo Burnham, for its honest portrayal of adolescence. Throughout the film, Kayla struggles with social anxiety, which is exacerbated by being given the “Most Quiet” award. She is most herself in front of her computer in her bedroom, where she confidently broadcasts herself to her few followers on YouTube, all while her single father tries his best to parent her. Now in cinemas in Australia, the film is being praised for the compassionate portrayal of the awkward transition into adulthood. Already on Rotten Tomatoes, Eighth Grade has received a rating 99%. On Twitter, the film has been met with widespread acclaim. Why do I always bawl whenever I watch #EighthGrade? Anyways, great movie (third in my top five of the year, after A Star is Born and Bohemian Rhapsody and before A Quiet Place and Game Night) and @boburnham and @ElsieKFisher deserve all the nominations and awards. Gucci!???????? Burnham’s screenplay was selected as one of the top 10 films of 2018, and Elsie Fisher, who plays the protagonist, has been nominated for the Golden Globe for Best Actress. With all the chatter around the unique and award winning film, it ought to be the next on your list. Eighth Grade is in cinemas in Australia now.